Located in the Capalbio countryside, which is in the beautiful Maremma region of Tuscany, is the incredible Tarot Garden, or Giardino da Tarocchi. Located in the Capalbio countryside, which is in the beautiful Maremma region of Tuscany, is the incredible Tarot Garden, or Giardino da Tarocchi. In stunning natural surroundings, with fantastic views over the Tuscan landscape, you can see huge, colourful sculptures which depict the 22 Major Arcana of the Tarot Cards. 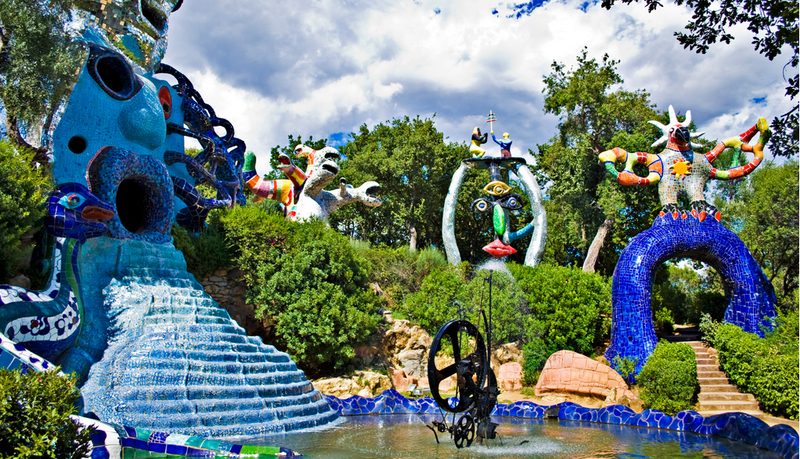 This garden, designed by French artist Niki de Saint Phalle, is a truly magical place, and well worth a visit. Why not choose one of our charming Tuscany country villas in this region and go and explore this magnificent garden for yourself? The design and construction of this spectacular place first began in the late 1970s, and was largely inspired by Niki de Saint Phalle’s visits to Barcellona, where she discovered the works of Gaudi, in particular in the Park Guell. These visits prompted her to come up with her own ideas for a sculpture garden. She had done design and architectural projects all over the world, even winning awards for her work, but this was to be one of her finest creations. So, in 1978, she began laying out the plans for her garden and started work on the first sculpture in 1980. The official opening of the Tarot Garden took place in 1998, but Niki continued working on it right up until her death in 2002. So what exactly can you see in the Giardino da Tarocchi? Well, all 22 of the cards are represented, from the magician, to the hermit, devil, sun and moon. The artist not only created and designed the sculptures, but also personally built them, so what you will see is a true representation of her personal view of the tarot cards, which happened to be one of her great passions when she was alive. She chose the beautiful Tuscan countryside in order to establish ‘a small Eden’ where man and nature could meet, and upon doing this, she succeeded in creating an amazing, magical place. The sculptures are both suggestive and evocative and showcase the artists incredible talent. They were built using steel and concrete, then covered with mirrors, coloured glass and ceramics, to create very bright and colourful figures. These huge representations of the cards can be explored both inside and out, and the grand Empress not only has a roof terrace, where you can enjoy wonderful views of the Mediterranean, but also a mirror-glassed cavern, with a kitchen, bedroom and bathroom! The artist actually lived here whilst constructing the garden. Other notable representations are the Grand Tower, the majestic Fountain and the enclosed dome of Temperance, which is adorned with thousands of mirrors inside. We have holiday villas available both in the Maremma region, which is where the garden is located, or near the beautiful Tuscan coast. You could even treat yourself, with a stay in our luxury villas Tuscany coast accomodations. We have a selection of gorgeous farmhouses with private pools all over the region, particularly near the coast. Get booking now, and enjoy a relaxing, artistic Tuscan holiday!